What a nice week here at the farm. The warmth seemed to wake up all the plants, all at once. We love the beauty of the flowering trees, especially the stone fruits (peaches, plums, cherries, apricots) and pome fruits (pears and apples). Even if these trees are tricky to get good fruit without sprays, they're worth planting just for the spring blossoms. Some of our trees are flowering for the first time this year and some will flower in late April to early May (apple, persimmon, pawpaw) and on into June (jujube). 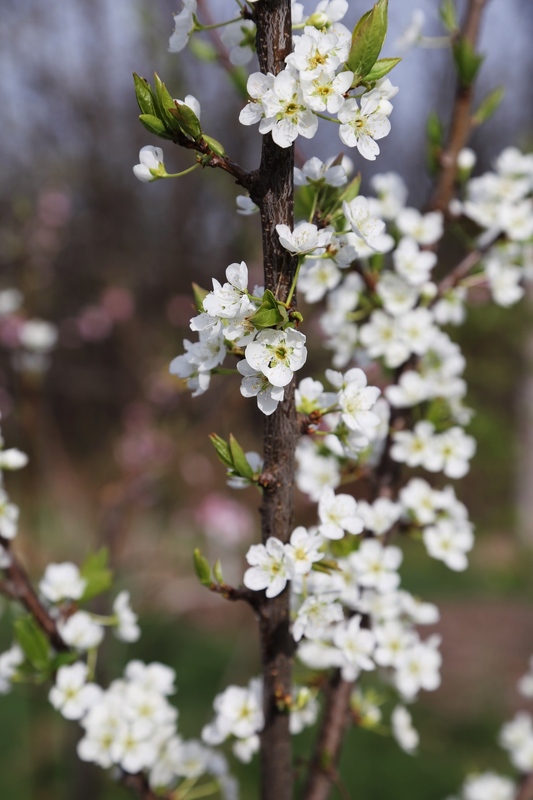 We hope you enjoy these fruit blossoms and hope it even spurs you to start your own little orchard! 'Ruby Sweet' plum. Let's hope for at least a few this year! Everything has taken on that spring green color. An espaliered Asian pear 'Yoinashi' is among the first to bloom. Some of the blueberries are rather close to opening. Can't wait for fresh berries in just a couple months. Honeyberries put on some nice blossoms and are one of the first fruits to ripen. If only I could get to the fruit before the birds do.